Yes, it's quite funny to see the county's response, especially after one reads the absurd and ill written Memorandum Social Betterment Properties International filed that the County is responding to! "Scientology cries religious discrimination in appeal brief filed in Maryland zoning fight"
"Trout Run: Petition for Judicial Review Part 1"
Scientology has made another filing in the Trout Run legal spat over the prospect of opening a boutique VIP Narconon rehab center in Maryland. After the county gave its reasons for saying no, Scientology comes back with bawling you have to see. members went to the court hearing yesterday, held on Social Betterment's appeal of the Frederick County MD Council's veto against Social Betterment Properties' attempt to get a land use exception by applying for a place on the historic registry - despite the property not being historic. Their appeal claims the reason why the council vetoed it was due to discrimination against Scientology religion. Bunch of baloney. It was a lot of fun and the judge could not have been better choice. We were not allowed to have cell phones on or record the hearing and note taking was difficult since most of us were a party to the case, so Tony Ortega did a short article here which he updated later on after we spoke b phone. See second link below. Further down are links to some local and state media reports on the court hearing. "We’re hoping to get a report today from some correspondents on the scene when Scientology’s administrative appeal in Frederick County, Maryland is argued in a court of law." [..] UPDATE: We just had a telephone conversation with Mary McConnell, who gave us some basics on how the hearing went today. First, the news. Judge Nicklas did hear oral arguments from the two sides today, and gave himself 30 days to render a decision. Mary said she found the hearing to be a lot of fun as Judge Nicklas proved to be knowledgeable about the subject areas in general (including drug rehab) and in the case facts in particular. Mary said that SBPI’s attorneys (SBPI is a subsidiary of the Church of Scientology) tried to convince the judge that this was really a zoning case, but he wasn’t having it. “They kept trying to make this a zoning case, but he was on their game and said he knew it wasn’t a zoning matter,” Mary says. The dispute is really about whether the Frederick County Council acted properly when it voted not to put Trout Run on its list of historic places, even after its own Historic Preservation Commission recommended that it be added. SBPI tried to convince Judge Nicklas that the council had always, in the past, simply accepted the recommendation of the commission. This was the first time it did not put a place on the historic list after the Commission recommended it. SBPI seemed to imply that the council had an obligation to follow the commission’s suggestion. The other side, meanwhile, tried to keep things focused and simple. “The county’s attorney was clear: This is a legislative issue, not a zoning one,” Mary said. We asked Mary how the judge reacted when SBPI’s attorney brought up the notion that the Church of Scientology had been discriminated against. [..]Testimony at the public hearings relating to the designation was also debated Monday. Kneeland ( Social Betterment Attorney ) said the council’s final vote was an attempt to appease the “whims and fears” of the community. She read statements — from letters sent to the council and the public hearings — about the Church of Scientology and Narconon that she felt were derogatory. “Those reasons to motivate a decision are improper. An agency is not allowed to discriminate on the basis of religion,” she told Nicklas. Kearney (County Attorney ) said it should be expected that those testifying at a council meeting without an attorney may introduce irrelevant ideas in their testimony, just as happens in court, she said. That doesn’t discredit the council’s analysis of the property’s historic significance, she said. Kearney said Social Betterment put its own plans at risk when the organization bought property not already zoned to allow a Narconon center to open. In the NBC article below, they provide an un-linkable video, which gives more details and is much more balanced. Watch Scientology's OSA, National Affairs Office Sylvia and John Stanard walk away with theyr attorneys, without giving comment The guy at the end being interviewed is my friend Mark Long who along with myself and others are Interested Parties who SBPI wants to boot from the case. Judge didn't take oral arguments or rule on those Motions but allowed us sit up in front on the county attorney side as parties to the case. Thanks for the update Mary. Nice to see the Judge staying on focus, and not falling into the "zoning" fallicy $cientology was trying to make the case into. Excerpt: The Frederick County Planning Commission recommended Wednesday that the County Council approve a zoning change that would prevent drug recovery programs from operating on historic properties. 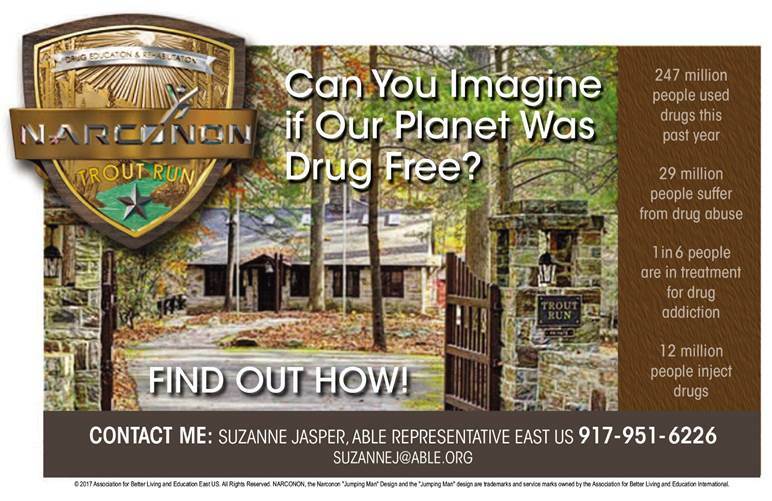 The recommendation comes in the wake of last year's fight over whether an affiliate of the Church of Scientology — Narconon — could use an old recreation camp in the Catoctin Mountains called Trout Run for a drug treatment center. The commission voted unanimously in favor of a County Council bill to remove group homes from the list of special-exception uses allowed on sites on the county's Register of Historic Places. The council has scheduled a third reading and likely will vote on the bill Feb. 16, but it may not settle what happens to Trout Run, and Narconon's plan for it. Tomorrow's County Council Agenda shows a "third reading" of bill 16-02 for the proposed special exemption changes. It also notes "council decision" and I'm wondering if that means there will be a vote on it? Well, the bill is postponed by consensus until next legislative day (45 days away) in order for the board to receive and consider other proposed amendments which Councilman Donald's is planning on submitting to the council which are apparently integral in some way to the bill and complex in nature. Anyone know what this is about? That is bill is still pending. If they're hoping for a new law change to fix an old application rather than doing the paperwork the court requested, I think they'll regret it. There will be another lawsuit, and they might end up with Narconon grandfathered in. The county council are in the works to get the law changed to remove group homes from that HPC law so that in the event groups with HPC applications like Social Betterment won't ever be able to apply in a resource conservation zoned land. But if Social Betterment Properties lost in the court review/appeal, they would have to wait 2 years to apply again, so they would not be able to apply anyway if that law it in place. If they won their case on the review/appeal, then the law would not apply to them. However, right now the bill for that change in law is being held for 45 days pending other zoning change issues being discussed. Councilman Donald was not clear about what those changes are but the council seemed to know and they all agreed to set aside the bill for 45 days pending. Meantime, all this with the Trout Run / SBPI court remand was still pending. Then on the 26th of Feb the attorneys for both sides terminated. The cases in inactive/closed status and can be brought back which is why it was weird to see a new case filed instead of reopening the old one. What I suspect this new civil action is about is that some sort of agreement was made between SBPI and the County Council attorneys and part of that was to have SBPI close of the appeal case by terminating as council. The county attorneys followed on the same day and terminated as well - as I mentioned. Perhaps what happened was that that deal or whatever agreement they made on the review appeal case fell through or SBPI did not anticipate something which latter happened. However, I would think they would file in the original case,m not a new one. So I suspect that this new case must be about something new, separate ( possibly related but not directly) from the appeal review case. Thus I am inclined to think that SBPI filed for " Injunctive and Declaratory Relief and Request for Expedited Relief with Exhibits" against Frederick County and the 3 zoning and planning 3 agencies because of some deviation of whatever agreement they had with the county concerning the original case or relief to get the original case defaulted in their favor. I am hoping to see the documents soon. Then we can know more. What ever became of the Trout Run site? If no resolution yet, does anyone know when it is expected? Scientology filed a new lawsuit. The court has been extremely backwards about giving out copies of it. Hoping to have it soon. Probably premature to say I told ya so. I guess this must be it, right? I just realized that this thread had not been updated in some time, so I will post some info and links. ORDERED, that the Plaintiff's motion for summary judgment be granted in part and that the documents stated as not privileged in this opinion be produced to the Plaintiff by the Defendant within 10 days; ORDERED, that the Plaintiff's motion for summary judgment be denied in part and that the Plaintiff is not entitled to damages as stated in this opinion. During this same time period, Social Betterment Properties International tried to file a new and separate Petition for Administrative Review of the County Council's veto of their application for historic designation but the court made them go back and reopen the original case that was opened on July 1, 2015, and closed Feb 26, 2016. After a series of bungling moves and filings on the part of Social Betterment Properties to the court on this new request to reopen the above case, including sending to the court and all parties, including myself and other interested parties on the case, CDs with many many non-relevant copies of email exchanges and documents. They did this making it appear to the clerk that the records and cds were from the County, not SBPI. C/O filed that the time for Petitioner, Social Betterment, to file its memorandum in support of its Petition for Judicial Review, is extended through and including September 29, 2016. Since then, with mutual approval by the County attorneys, Social Betterment Properties has since filed multiple requests for extension of time to file the required, the last being in January 2017. That extension ends on February 17th of this year. Since January, 2 of the 3 attorneys for Social Betterment have gone to another law firm. This left attorney Bruce Dean alone until 3 new attorneys from his company's Bethesda firm were admitted as co-council January 27th 2017. SBPI's complaints in the past are that the Council based their decision to veto the application for historic designation on the Scientology connection. They claimed that they could prove that bu having access to all the all the emails and inter council correspondence which the council claimed were 'attorney-client privileged'. The case linked above was their lawsuit to get access to all that had been listed as such, but in the end, the judge on that case only ruled in favor of some, not all of the documents, and did not give the damages $$$ that SBPI asked for. My impression on that is that there were only a small amount items on that list that were ordered turned over and that the county attorneys were not deeded to have intentionally withheld anything. So the new legal team for the Scientology front group Social Betterment Properties International has to get it together and present this Memorandum supporting its argument. Frankly, I don't think they have a case and this is why they have not been successful in finding any law to support their Petition. I don't think the court is going to let this drag on much longer. Once it is filed, all parties will then have 30 days to respond. Our dedicated interested parties are looking forward to reading the justifications SBPI comes up with, and will be responding to them in support of the Council's veto. I promise to update this thread. *I believe one needs to logged into Facebook to access the files. Aaaaaargh! Why does everything have to tie to Farcebook?? Sorry BigBeard... but that group is where the documents would be most read and posted by multiple people involved in the case. They have over 360 members in that group. The direct pdf links will only be accessible to facebookers because they are posted in a members only group. Its a real hassle for me to download them to my computer and upload them to my scribd. I'm a moderator there so PM me if you or someone near you, have a FB profile and would want to join the group for a day to access and read them, I would approve the person to join. Thanks Mary, but for a number of reasons I don't use Face Book or Twitter. I guess most of you have seen this from the Thursday Funnies on Mike Rinder's Blog. I'm thinking that they may be networking with the State of Maryland while awaiting their appeal petition in court ( which they are dragging on with multiple extensions, mutually stipulated by with the county) in order to squeeze in a small educational program, thereby avoiding having to obtain a license. But that's just a thought because what Narconon organization would have the audacity to advertise like this, knowing there are critics keeping an eye out for such stuff? Thanks, Mary. I was hoping they weren't trying to go the sober living route. Anyone have any idea what's going on with this?? When I hear "settlement" and a $cientology front in the same sentence, I get nervous. The deadline for SBPI to file their memorandum was extended x 12 by Frederick County Circuit Court judges. I wonder why??? Between August 2016 and January of this year, Frederick County Circuit Court judges extended SBPI’s deadline for filing a memorandum in support of its petition for judicial review 12 separate times. The most recent deadline to file the memorandum was Feb. 15. The day before, attorneys for SBPI filed a 13th motion for extension, requesting a new deadline of April 16. The motion was denied by Frederick County Circuit Judge Theresa M. Adams on Feb. 14. Attorneys for both sides of the case notified the court Thursday that they had reached an agreement and were close to finalizing a settlement. Waiting for settlement agreement to be filed with the court. The court gave the parties 3 months to get one done, or it's back to court. Of course, the interested parties, myself included, are nmot privy to these discussions, nor the finalization of the agreement. However, the county attorney stated the council would make the agreement and it's terms available once completed. The interested parties were not privy to a seprate lawsuit, where in a large # of certain county mails or documents were disputed by SBPI as being not being 'priviledged" a small # of them were deemed by the court in their favor. The judge ordered those to be turned over to SBPI. We don't know what was in those few documents, so we don't know whether they contain information against the county or in favor of SBPI... However, SBPI was the entity dragging it's feel for many months until the judge had enough and demanded the Memorandum they had not been able to produce. This provides a measure of hope that the county had the upper hand. And, so we wait. Deadline is approx May 19th.